Happy New Year! For my first post of the new year, I thought I’d talk about a subject I know well: vegan meal prep! Meal prep is a topic that strikes dread into the heart of anyone attempting Veganuary as well as long-standing vegans, but fear not, help is at hand! 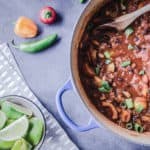 Here, I’m going to give you my top vegan meal prep tips, followed by a recipe for my favourite Warming Bean Chili – by far the ultimate meal to make a huge batch of (secret – batch cooking is KEY when it comes to vegan meal prep!). We make this weekly at home and it’s become a firm favourite. First and foremost however, if you’ve decided to try going vegan for 2019 and are new to the lifestyle – hello! I’m so glad you’ve joined. Welcome to a world of cooking that’s full of flavour and beauty, and welcome to feeling good about knowing that what you’re eating is helping make the world a kinder place. If you’re feeling a bit overwhelmed by the sudden change in diet, I absolutely understand. I’ve been there. When I first turned vegan I remember thinking I’d never be full or nourished again, but I’m happy to report that those feelings of fear soon went away with a little exploration of new recipes and foods. I actually look back at my old habits and realise my way of eating was a quite limited! We’re lucky that nowadays we live in a world where there are a lot of plant-based options (it seems like almost every day a different company/shop/restaurant is launching new vegan products), making vegan meal prep a whole lot more accessible. Still, it can be daunting at first, and I totally understand that, so read on to find my top vegan meal prep tips. I’ll have you prepping like a pro in no time! And keep scrolling after to find the recipe for my gorgeous and oh-so-easy Warming Bean Chili (pictured). 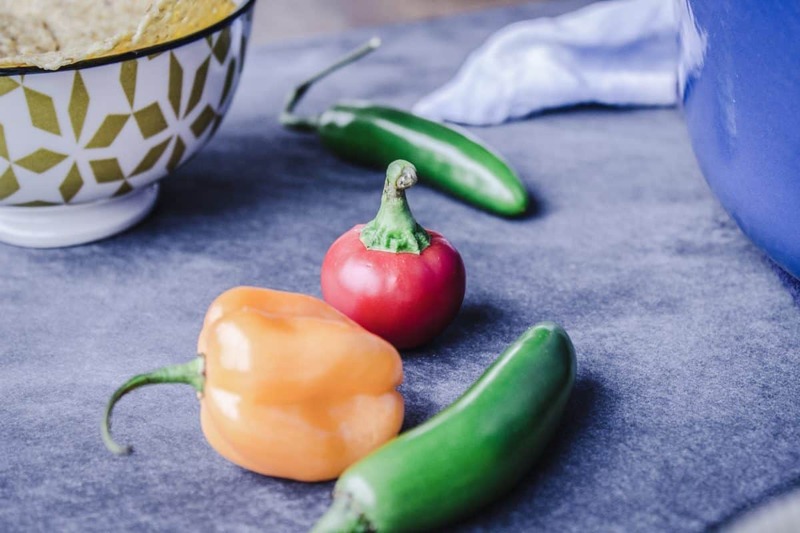 1) BATCH COOK – Without a doubt the most important tip of all, batch cooking is THE way to take the stress out of meal prepping. 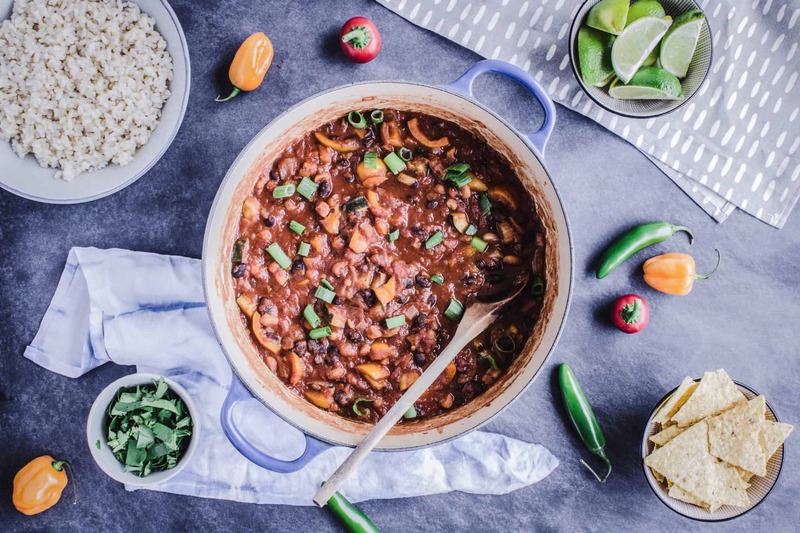 Find a few simple dishes you love (meals like soups, curries and salads work best – or my Warming Bean Chili below) and make large batches once a week. This way you’ll have plenty of food for the week ahead and won’t be worrying about what to cook. You can even make large batches of your favourite breakfasts like this Chocolatey Pecan Chia Cereal and store them in the fridge overnight, then grab and go in the morning! 2) PLAN YOUR FOOD – I know writing a meal plan sounds boring, but it saves so much time in the long run. If you plan out what you’ll be eating in advance for breakfast, lunch and dinner every day at the beginning of the week, it takes a lot of stress out of cooking and means you’ll never be hungry! You’ll also never get home and be faced with empty cupboards, as you’ll have shopped according to your plan. 3) STICK TO YOUR SHOPPING LIST – Tempting as it is to shop without a list and think you’ll remember everything you need for the week, trust me – you won’t. After making your meal plan, write a shopping list and only buy those ingredients! You’ll avoid buying unnecessary items and cut down on food waste (I’m looking at you, pointless bunch of radishes). I also heartily recommend shopping on a full stomach. You’re way less likely to buy snacks and treats (usually more expensive than basic ingredients) if your blood sugar isn’t crashing. 4) STOCK YOUR FRIDGE WITH BASICS – Make a few simple items at the beginning of the week to ensure you’ve always got food on-hand. I always like to have a jar of my favourite homemade dressing in the fridge (Jamie Oliver has some great recipes for simple jam jar dressings which I use all the time). I also like making a big batch of a whole grain on Monday night (rice, millet, quinoa etc.) which I can then eat with salads or stews over the course of the week. 5) GO SIMPLE – This tip is especially for anyone new to veganism (although we could all do with a reminder!). Keep things simple by making easy, quick-to-prepare dishes, and save the more complicated meals for when you’re a bit more experienced or have more time. Try making delicious one-pot dishes that yield lots of portions, like hearty stews or my Warming Bean Chili below. As you get more familiar with eating plant-based, you’ll naturally want to branch out and try more challenging recipes, but to start with make it as easy as possible for yourself! 6) IT’S ALL IN THE TOOLS – It sounds really obvious I know, but tools make all the difference. Having a sharp knife will make slicing vegetables so much easier! Likewise, using something like a food processor or a mandolin (I know – I wasn’t convinced either, then I bought one and now use it literally every day) to shred vegetables will save huge amounts of time. All ready to make a big batch of something delicious? Try the recipe for my Warming Bean Chili, below….. 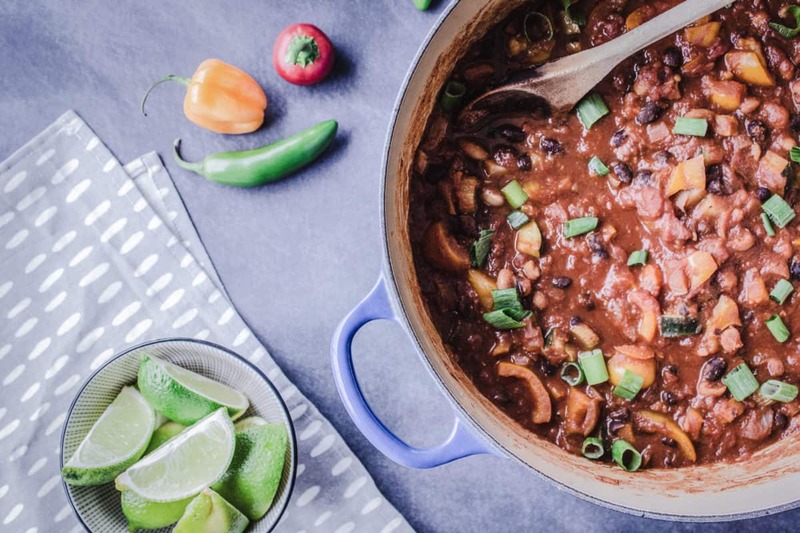 If you're looking for an easy and delicious weekday dinner that will give you leftovers, try this vegan, gluten-free Warming Bean Chili. It's packed full of veggies and protein to keep you full! Prepare all ingredients as instructed above. Add the onion to a large cooking pot, along with approx. 2 tbsp water. Using a medium stovetop heat, steam sauté the onion for 10 minutes with the lid on the pan, stirring regularly to prevent sticking. After 10 minutes, when the onion is just starting to soften add all other ingredients to the pot, stirring them to combine. Increasing the heat, bring the mixture to a boil then reduce the heat to low/medium and cover the pot with a lid (continuing to stir regularly). If the chili looks thick at this stage, don't be tempted to add liquid! As the vegetables cook they will release water and the chili will naturally become more liquid. Simmer the chili for approximately 15-20 minutes, until the zucchini/courgette is tender. Remove from the heat, and serve with brown rice, avocado slices, lime wedges, chopped cilantro and tortilla chips. Enjoy! Looking for more recipes you can prepare ahead of time in big batches? Try my Winter Warming Dhal, Easy Eggplant and Chickpea Stew, Vibrant Thai Yellow Curry and Vegan Shepherd’s Pie!